The Business Sales Consultant is involved in generating revenue for the company by enhancing the sales volume through a number of channels. 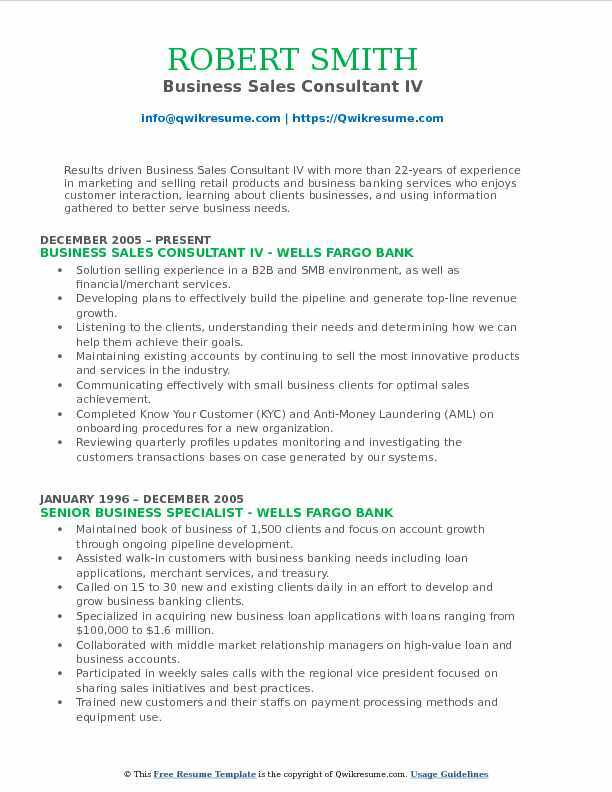 Typical Business Sales Consultant Resume Sample comprises of various responsibilities such as – identifying potential buyers, discussing the needs of the customers, analyzing business practices, learning about the sales product, services and its terms, setting sales target for the sales department, collaborating to prepare strategies, monitoring the sales volume, analyzing market trends, motivating sales team and arranging meeting for demonstration with prospective buyers. To become a Business Sales Consultant you need to have Sales driving capacity, confidence, negotiation capability and enthusiasm are some of the needed background skills. Eligible Candidates should possess a Bachelor’s degree in pertinent fields such as Business or marketing or finance. 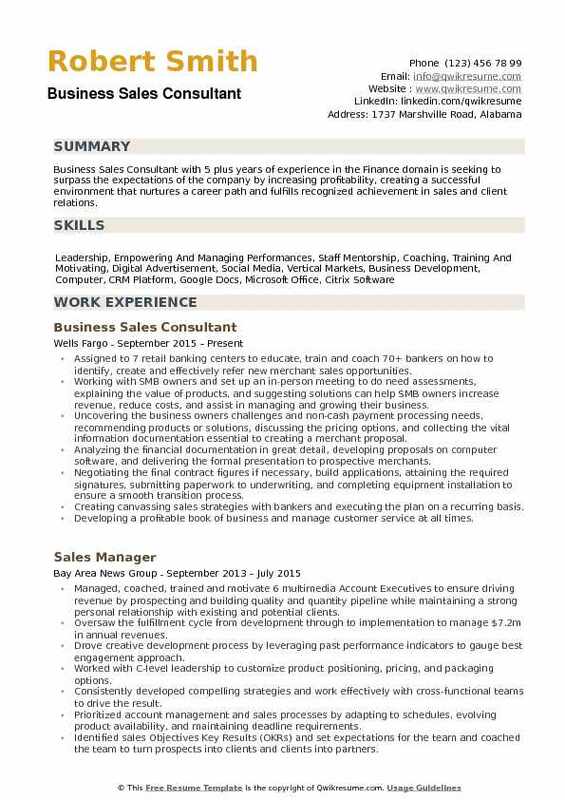 Headline : Highly competitive, self-motivated, and energetic Business Sales Consultant with 5 plus years of experience in the Finance domain and with exceptional talents in sales, relationship building, organizational management and prioritization capabilities. Targeted large businesses averaging 5mn+ in sales and 25-500 employees. Proposing complex, "problem-solving solutions, " necessary for acquiring "upstream" clientele. Heavy outbound activities making over 30+ calls daily to develop new merchant opportunity. Fostering new center of influence relationships, intended on the development of lead sources. Accumulating and analyzing the merchant statements to develop strategic pricing solutions to optimize savings and profit. Initiating the rookie workshops in the San Diego markets to accelerate ramp-up time. Developing and implementing the business strategies for clover deck and pricing strategy for the revenue of clover equipment sales/leasing. Preparing the monthly, quarterly and annual reports for upper management regarding clover and lease revenue. Exceeded monthly goal of $2.8 million signed volume, $10,000 equipment sales, $10,000 reoccurring revenue and 12 new relationships. Summary : Experienced Business Sales Consultant II with 17+ years of overall Sales Experience, is seeking to obtain a position that will provide me with experience in managerial skills with an opportunity for advancement. 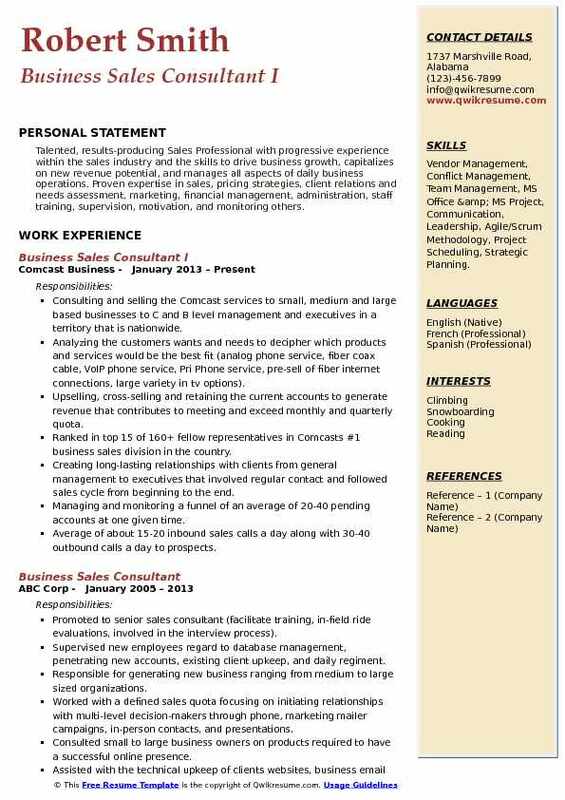 Skills : Working Knowledge Of Computer, Tablet, And Mobile Systems, Leader, Highly Competitive, Self-sufficient, Detail Oriented, Exceptional Time Management, Microsoft Office Suite, CRM, SVP, KOL Dashboard, RB Zone, WCIS, Lamp, And Adobe. Responsible for the sales of Burglar Intrusion Systems and CCTV surveillance systems for the commercial businesses. Providing face to face presentations and demonstrations of intrusion equipment with business owners. Designing and diagraming the best application and placement of alarm intrusion and CCTV surveillance equipment to fit the customer's specific needs. Generating new commercial opportunities for aiding in the growth of Brinks business security. Qualifying the commercial growth opportunities generated by Brinks business security. Cold calling the new and existing businesses to gain new customers and increase my customer base. Developing relationships with new customers to gain referrals for future business. Brinks home security ring of honor recipient for high sales achievements. Achieved multiple monthly awards for sales achievements and part of the 2009 national branch of the year. Summary : Business Sales Consultant I with 12 plus years of experience in the Finance domain is seeking to obtain critical experience and be a valuable asset in the banking or finance industry. Coordinating the business relations between departments to ensure sales performance are met. Managing the due diligence activities in support of new business or product opportunities. Communicating new and proposed product features to company executives. Developing customized strategies for mid-size to large company executives in regards to products and sales. Sourcing and developing the relationships with new small to large size business clients. Prospecting, closing new business deals by highlighting the value and product benefits. Meeting and exceeding sales quota within a low volume environment. Using business strategies to ensure it meets company revenue and profit objectives through prospecting. Generated over $5 million in business sales within a well define quota timeline. Summary : Senior Business Sales Consultant with 8 plus years of experience in the Technology and Telecommunications domain focused on maximizing sales by managing all accounts systematically and logically. Believes consistency and dedication build the most successful business partnerships. 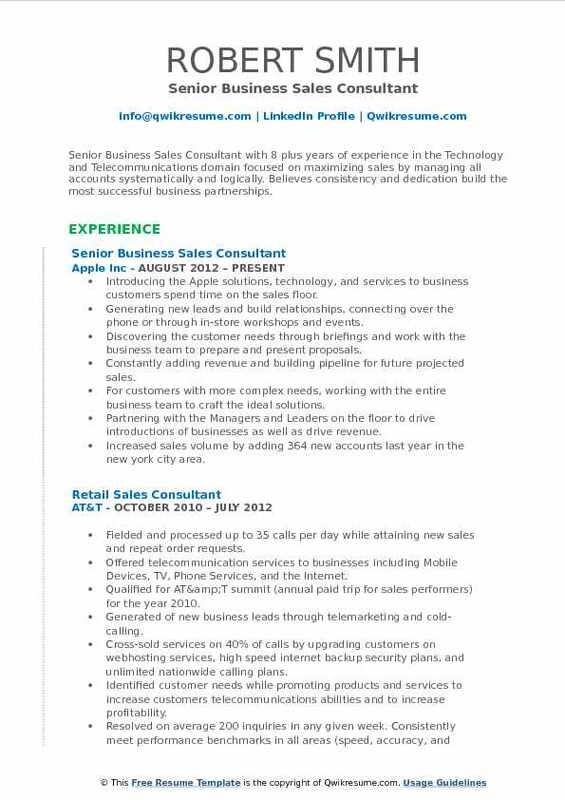 Skills : Prospecting and cold calling, Proven sales track record, Strategic account development, Upselling and consultative selling, Relationship selling, MS Office, Customer-oriented, Mac OS & iOS proficient. Introducing the Apple solutions, technology, and services to business customers spend time on the sales floor. Generating new leads and build relationships, connecting over the phone or through in-store workshops and events. Discovering the customer needs through briefings and work with the business team to prepare and present proposals. Constantly adding revenue and building pipeline for future projected sales. For customers with more complex needs, working with the entire business team to craft the ideal solutions. Partnering with the Managers and Leaders on the floor to drive introductions of businesses as well as drive revenue. Increased sales volume by adding 364 new accounts last year in the new york city area. 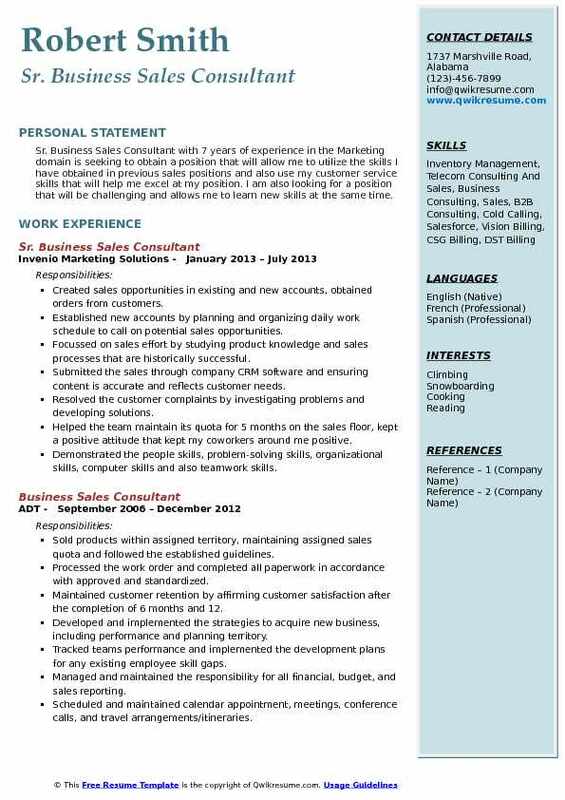 Summary : Sr. Business Sales Consultant with 7 years of experience in the Marketing domain is seeking to obtain a position that will allow me to utilize the skills I have obtained in previous sales positions and also use my customer service skills that will help me excel at my position. I am also looking for a position that will be challenging and allows me to learn new skills at the same time. Created sales opportunities in existing and new accounts, obtained orders from customers. Established new accounts by planning and organizing daily work schedule to call on potential sales opportunities. Focussed on sales effort by studying product knowledge and sales processes that are historically successful. Submitted the sales through company CRM software and ensuring content is accurate and reflects customer needs. Resolved the customer complaints by investigating problems and developing solutions. Helped the team maintain its quota for 5 months on the sales floor, kept a positive attitude that kept my coworkers around me positive. Demonstrated the people skills, problem-solving skills, organizational skills, computer skills and also teamwork skills. Summary : Dynamic and results driven Business Sales Consultant with over ten years of sales and sales management experience in the Finance domain with a highly competitive nature and demonstrated ability to exceed established sales goals. During 2010 was responsible for introducing the Wells Fargo merchant services brand to Wachovia branches including branch staff, management, communities, and clients while growing a book of business complete with 190% target profit achievement, 210% unit achievement, and 187% equipment penetration rates. Creating and delivering effective presentations resulting in the highest number of generated referrals among a region composed of five states and over 76 markets. Developing and maintaining a relationship with senior banking leadership by delivering quantifiable results and strong communication and frequent progress and status updates. Achieved the highest closing percentage in the region for six consecutive months of 59% from. Implemented multiple marketing blitzes and events to ensure consistent lead generation. Developed and maintained relationships with over 65 bankers, 80 tellers, 26 managers in order to cultivate consistent lead flow. Leading the sales team with multiple self-sourced accounts monthly through customer referrals and follow-ups and charged with presenting and sharing best practices in order to assist struggling team members. 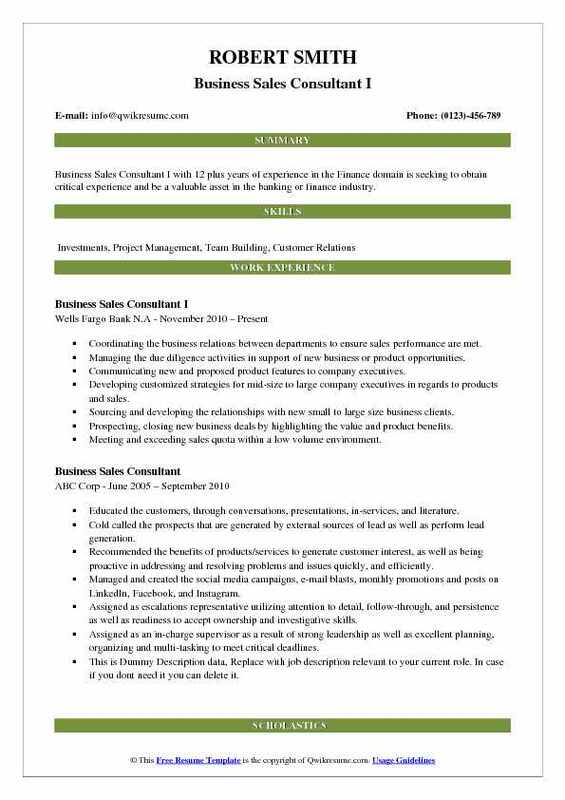 Summary : Results driven Business Sales Consultant IV with more than 22-years of experience in marketing and selling retail products and business banking services who enjoys customer interaction, learning about clients businesses, and using information gathered to better serve business needs. Solution selling experience in a B2B and SMB environment, as well as financial/merchant services. Developing plans to effectively build the pipeline and generate top-line revenue growth. Listening to the clients, understanding their needs and determining how we can help them achieve their goals. Maintaining existing accounts by continuing to sell the most innovative products and services in the industry. Communicating effectively with small business clients for optimal sales achievement. Completed Know Your Customer (KYC) and Anti-Money Laundering (AML) on onboarding procedures for a new organization. Reviewing quarterly profiles updates monitoring and investigating the customer's transactions bases on case generated by our systems. Cross-selling other banking products. Demonstrating equipment options and selling software. Objective : Junior Business & Sales Consultant with 3 plus years of experience is seeking to obtain a challenging leadership position with a world-class organization that will utilize my management and administrative expertise. Developing the project plans with forecasts, estimates, and resource assignments. Participating in the analysis of business needs and proffering solutions to meet those needs. Identifying risks and liabilities that may be associated with carrying on certain tasks, businesses or transactions by vetting documents and organizational policies and legal requirements and obligations. Participating in the acquisition of a sister company by liaising with key end-users and other key stakeholders to create seamless and effective transition. Recommending strategic features to be incorporated with the company's platform to foster user-friendliness and effectiveness using search spring, counter-selling, and up-selling and live chat. Building/processing and fulfilling products on platforms such as NetSuite and Magento. Recruited technicians and provided remote support to technicians in the field. 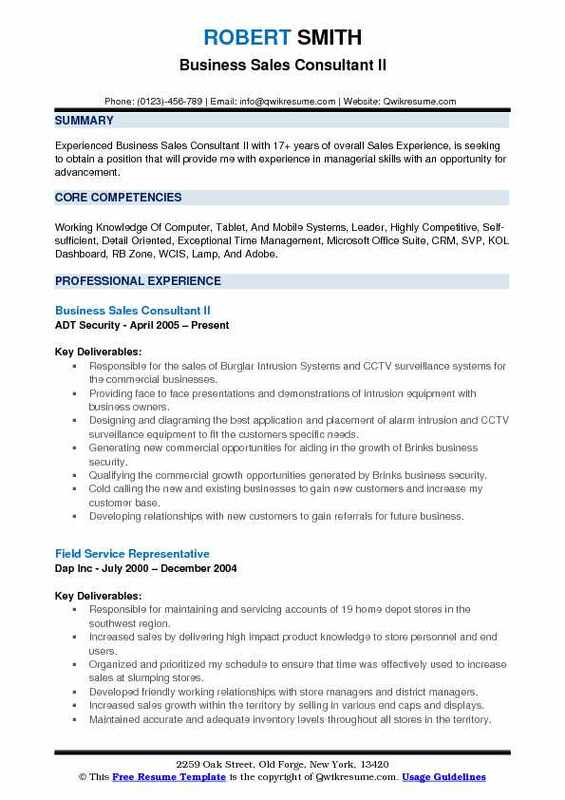 Summary : Talented, results-producing Sales Professional with progressive experience within the sales industry and the skills to drive business growth, capitalizes on new revenue potential, and manages all aspects of daily business operations. Proven expertise in sales, pricing strategies, client relations and needs assessment, marketing, financial management, administration, staff training, supervision, motivation, and monitoring others. 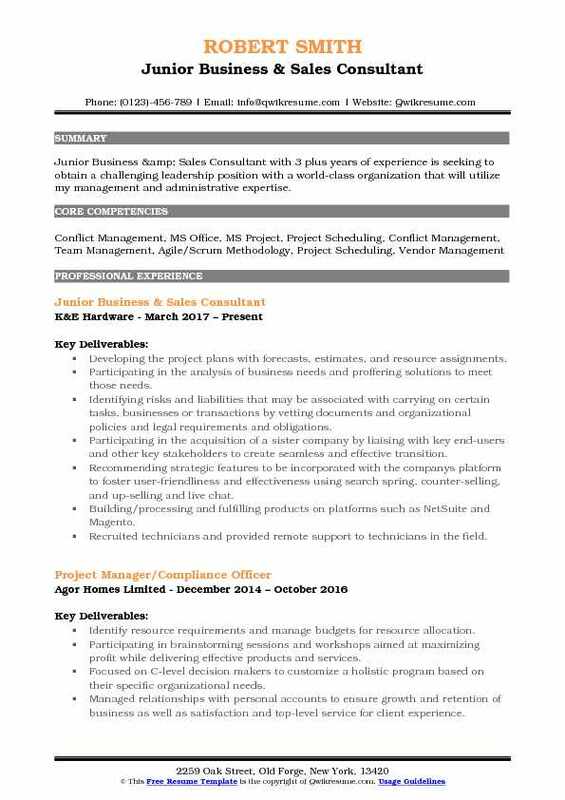 Skills : Vendor Management, Conflict Management, Team Management, MS Office & MS Project, Communication, Leadership, Agile/Scrum Methodology, Project Scheduling, Strategic Planning. Consulting and selling the Comcast services to small, medium and large based businesses to C and B level management and executives in a territory that is nationwide. Analyzing the customers wants and needs to decipher which products and services would be the best fit (analog phone service, fiber coax cable, VoIP phone service, Pri Phone service, pre-sell of fiber internet connections, large variety in tv options). Upselling, cross-selling and retaining the current accounts to generate revenue that contributes to meeting and exceed monthly and quarterly quota. Ranked in top 15 of 160+ fellow representatives in Comcast's #1 business sales division in the country. Creating long-lasting relationships with clients from general management to executives that involved regular contact and followed sales cycle from beginning to the end. Managing and monitoring a funnel of an average of 20-40 pending accounts at one given time. Average of about 15-20 inbound sales calls a day along with 30-40 outbound calls a day to prospects. One of top 12 business consultants selected based on performance to work remotely 3 days a week as a reward for performance. 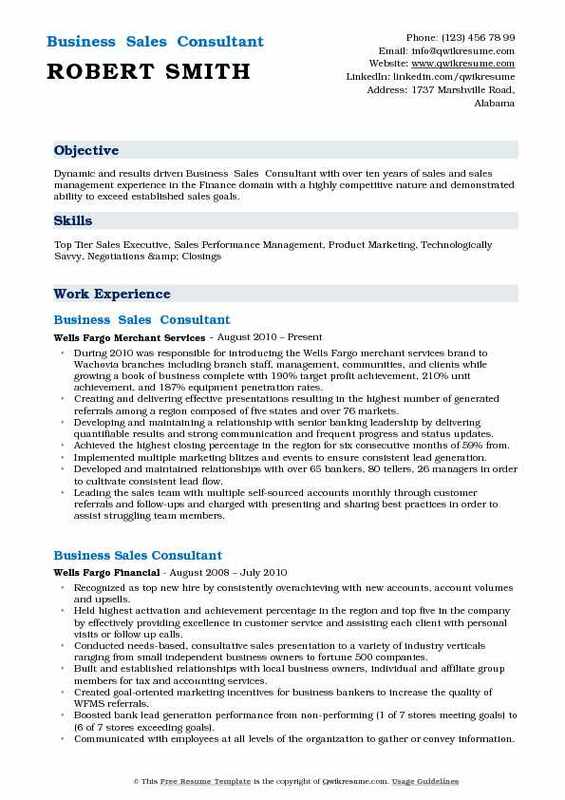 Headline : Business Sales Consultant with 5 plus years of experience in the Finance domain is seeking to surpass the expectations of the company by increasing profitability, creating a successful environment that nurtures a career path and fulfills recognized achievement in sales and client relations. Assigned to 7 retail banking centers to educate, train and coach 70+ bankers on how to identify, create and effectively refer new merchant sales opportunities. Working with SMB owners and set up an in-person meeting to do need assessments, explaining the value of products, and suggesting solutions can help SMB owners increase revenue, reduce costs, and assist in managing and growing their business. Uncovering the business owners challenges and non-cash payment processing needs, recommending products or solutions, discussing the pricing options, and collecting the vital information documentation essential to creating a merchant proposal. Analyzing the financial documentation in great detail, developing proposals on computer software, and delivering the formal presentation to prospective merchants. Negotiating the final contract figures if necessary, build applications, attaining the required signatures, submitting paperwork to underwriting, and completing equipment installation to ensure a smooth transition process. Creating canvassing sales strategies with bankers and executing the plan on a recurring basis. Developing a profitable book of business and manage customer service at all times.